Don’t be fooled into thinking that Trollope’s stories are too clerical to be entertaining; the Barchester Chronicles are less about religion and the church than they are about petty fighting, internecine warfare and a love of tribal conflict. The invasion of Barchester by the Londoners who now hold the palace represents the incursion of industrialisation and progress into England’s peaceful, bucolic heartlands. Mr. Harding’s tribulations with The Jupiter in The Warden were merely the first warning shots of the coming struggle: this is the real thing. Dr. Proudie is the Bishop of Barchester by appointment; Obadiah Slope, his personal chaplain, has the run of the diocese and enough intelligence to make himself pre-eminent in Barchester; Archdeacon Grantly virtually did the job himself during the final years of his father’s life and sees no reason why he should not continue to do so; and Mrs. Proudie… well, you’ll need to read the book to see how and why this Amazon hopes to take the power for herself! These petty wars with their mini-Napoleons are beautifully characterised by a writer who had an unerring eye for the beautiful and absurd in the everyday. One of the best scenes in the book is the confrontation at the palace where, for the first time, the contenders for the real power of the Bishopric stand arrayed, each intending to be unrivalled in Barchester, scrutinising the other claimants with an experienced eye and preparing to dive headlong into battle. Of course, also present, standing quietly to one side, is Mr. Harding, whose readmittance to the post of warden is the field upon which the battle is to be fought. Four proud, worldly gladiators – and a modest, sincere, religious man (who, ironically, fades into insignificance whenever his matters are discussed). I mentioned above Trollope’s intrusion into his novels as a narrator, albeit an occasional, benevolent and good-humoured one, and Milan Kundera also likes to put himself into his works. However the emigre Czech writer’s style is very, very different. Laughable Loves, a collection of (longish) short stories about love, lust and the games consenting adults play, is one of his earlier works; however, in some ways, it is more reminiscent of later works (Immortality, The Unbearable Lightness of Being) than his debut novel, The Joke. The seven stories relate the interactions in relationships between men and women in post-invasion Czechoslovakia, a place of great cynicism and little hope if one goes by the atmosphere of the book. Infidelity is rife, despite the nosiness of the neighbours, and there seems to be a curious disregard for the notion of staying faithful. It’s a very male-centred universe, with an expectation that it is simply part of a man’s daily life to pursue, and conquer (if desired), any attractive woman one comes across. This is not to say that the women are the victims; they are quite prepared to use their charms as currency to find an easier life for themselves. It all sounds a little pessimistic and unappealing (and no wonder given the external context), but the stories are intriguing, a fascinating insight into the battle of the sexes – which is just as much mental as it is physical. The reason for this is Kundera’s detached, quasi-scientific style of writing, which treats his characters almost like specimens in a laboratory. The great skill in his stories lies in his ability to take his subjects, drop them into a setting, add a catalyst (in the form of an attractive woman, a weekend out of the city or a political investigation) and watch them continue in their lives as best they can. This scientific approach comes across especially well in the style he adopts in discussing relationships. In some of the stories, short, alternating chapters tell the reader the thoughts of the two protagonists: we sit in the stark living room or the hotel restaurant, flitting from the mind of the man to that of the woman (and back again). Kundera has been criticised for the lack of development of his characters, with some saying that they are not characters at all, merely vehicles for Kundera to get his ideas across. This may be true; it does not, however, detract from the writing. 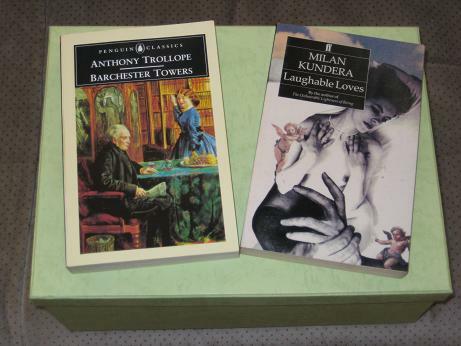 Trollope is really nice entertainment, particularly the Barchester novels. Barchester Towers is unbeatable with Mme Neroni who creates such a reputation around her. The scene at the Thorne's place is, in my estimation, among the best. I also liked Framley Parsonage, and the Last Chronicle of Barset- but the sub-plots are often too convoluted to follow. On the other hand, I find the Palliser novels less palatable- maybe i'm not mature enough yet to appreciate them. Yes, perhaps that's what i should do, because Trollope is really worthwile. Just as an aside: an old relative once told me that after he'd read Hemingway he could no more read Dickens or any of the Victorians…it's still something i cannot understand.